Form fill seal machinery, FFS machinery, and pouch manufacturing equipment. High Speed Form Fill Seal for small packages. Vertical form fill seal - or smaller operations. The larger form fill seal machinery can be vertical or horizontal. 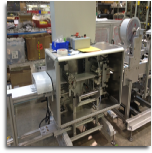 FFS machinery, that can be used to package diagnostic test kits and other IVD products. Also custom pouch manufacturing.